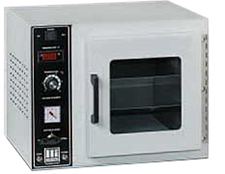 Our laboratory ovens are available in multiple sizes and styles. 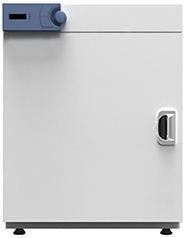 Choose from a series of utility, gravity or vacuum, and cleanroom types of ovens. These ovens include multiple features including high- temperature, vacuum and microprocessor controls. These laboratory ovens can be used for sample drying, baking, annealing, conditioning, sterilizing, evaporating and dehydrating, and other general laboratory work. Operating temperatures range up to 235°C (455°F). These ovens are cost-effective, rugged and versatile for both manufacturing and laboratory requirements. Energy efficient, low wattage double-wall insulated construction; impregnated fiberglass insulation, automatic bimetallic and hydraulic thermostat controls, sturdy, lightweight. Supplied with thermometer and holder. Two removable nickel plated metal shelves are included. Steel exterior, finished in a beige colored baked enamel with the inside chamber of aluminized iron. Inner chamber is insulated from the outer chamber with 2.5cm (1") of impregnated fiberglass. Designed for continuous temperature uniformity, the even air circulation will provide maximum temperature within one-half hour of start-up time. Intake/exhaust vents, door latch and cool handle. Bimetallic thermostat, neon pilot light and on/off switch. 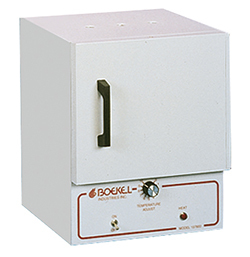 Ovens feature a vertical airflow pattern perfect for drying samples that require a low-turbulence environment. Ovens feature easy-to-use electronic controls and port on the top for inserting monitors. An advanced digital microprocessor control system provides superior temperature accuracy. Also included is a PT100 temperature sensor for the best overall advantages in repeatability and stability over a long period. An RS-232C interface for monitoring and controlling with a PC, storage function for both temperature and time, timer with alarm and error status up to 99 hours 59 minutes with delay and continuous function, and a digital backlit LCD display are also included. Ovens have been equipped with 3-sided heating mechanism which is the most advanced thermal technology for the best performance. It will contribute to more stable and precise experiments. A 110V cord and plug are included with all ovens. UL listed. 2 sizes, 1.75 and 3.7 cu.ft. Vacuum Ovens can be used for process drying under vacuum or standard atmospheric conditions. They are designed to operate with reduced pressures and/or inert atmospheres. These versatile ovens are equipped with a high reliability hydraulic thermostat to control temperature to ±1.5°C with a uniformity of ±5°C (at 100°C; 25" Hg) and built-in over temperature protection system. These vacuum ovens feature independent vacuum and purge needle valves. These ovens feature 3" of glass wool insulation, a silicone door gasket and a polycarbonate safety shield. The vacuum level gauge displays 0 to 30" Hg. The vacuum and air lines are constructed with corrosion-resistant stainless steel tubing for optimum chamber cleanliness and long term performance. 1384-1 Vacuum Oven, 0.44 cu.ft./12.5 L, 120V each P.O.R. 1384-1-220 Vacuum Oven, 0.44 cu.ft./12.5 L, 220V each P.O.R. 1384-2 Vacuum Oven, 0.7 cu. ft./19.8 L, 120V each P.O.R. 1384-2-220 Vacuum Oven, 0.7 cu. ft./19.8 L, 220V each P.O.R. 1384-3 Vacuum Oven, 2.3 cu. ft./65.1 L, 120V each P.O.R. 1384-3-220 Vacuum Oven, 2.3 cu. ft./65.1 L, 220V each P.O.R. This pumping kit consist of the VRI-2 pump with a KF16 hose adapter, ¼” thick wall silicone hose and rotary pump exhaust filter. The achievable vacuum is in the 10-2 mbar range. Very cost effective solution offering fast pumping speed and good end vacuum. Available both in 115V and 230V. This dry pumping kit consists of the #3436 diaphragm pump with s feet of ¼” thick wall silicon hose. This is a cost effective solution suitable for moderate vacuum requirements. Achievable vacuum is in the 200 mbar range. For higher vacuum levels, a two stage rotary pump would be more suitable. Available both in 115V and 230V.